Recently, Shotgun blogger PUBLIUS featured a video made by the Center for Freedom and Prosperity concerning a graph of the so-called “Rahn curve”. The video serves as a good example of what is wrong with the idea of founding upon quantitative economic arguments ones advocacy of individual freedom. 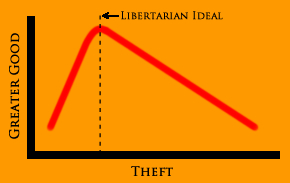 And, given the political orientation of those telling us about the Rahn curve, an explanation of why libertarians are prone to making the aforementioned error is warranted. There should be little argument that the Center’s video is being presented by an organization that wants the world to view it as advocating individual freedom. Were that not the case, I sincerely doubt that the “Center for Freedom and Prosperity” would bother mentioning freedom, and would instead call itself something like “The Centre for National Prosperity” (a name that would be more fitting). In the video, the Center’s spokesperson is Dan Mitchell, a libertarian economist who is both a founder of the Center, and is a senior fellow with the Cato Institute. The Cato Institute takes its name from Cato’s Letters, which the Institute describes as “…a series of libertarian pamphlets that helped lay the philosophical foundation for the American Revolution.” The Cato Institute states that its mission is: “…to increase the understanding of public policies based on the principles of limited government, free markets, individual liberty, and peace.” In short, the video is presented by entities that wish to be regarded as advocates of individual freedom. The purpose of the video is informed by the fact that those providing the video wish to be regarded, in doing so, as advocates of individual freedom. Accordingly, the arguments set out in the video purport to be arguments in defence of individual freedom (hence, of capitalism). So let us turn to the content of the video for the purposes of determining whether the video’s message strengthens or undermines the case for individual freedom. The video gets off to a bad start. The “Rahn Curve” graph does not disclose what, exactly, is being plotted. The X axis is labeled ambiguously as “Economic Performance”, and the Y axis is labeled just as ambiguously: “Size of Government”. That ambiguous labeling, together with such narrative as “But you the viewer only need to understand one thing”, suggests that the producers of the video are not very concerned with having viewers actually understand the curve, so long as viewers accept the curve as economic proof that government is currently too big. With not too much googling, one can find for oneself the units that the Center thought should be replaced with ambiguous terms. Values on the X axis (which the Center labels “Economic Performance”) are actually: Percentages of Annual Growth in GDP. Values on the Y axis are (which the Center calls “Size of Government”) are: Percentages of Annual GDP that is Spent by Government”. Mitchell tells the viewer that “economic performance” is maximized when government spending (a.k.a., the “size of government”) is somewhere in the range of 15% to 25% of GDP. He goes on to deliver the video’s take-home message: because U.S. government spending is in the 35% to 40% range, the Rahn curve demonstrates “…that government is too big, and this is reducing prosperity”. There are numerous problems with the Center’s use of the Rahn Curve as a basis for advocating individual freedom. First, consider the implications of an alleged freedom advocate advocating the maximization of annual growth in GDP. GDP growth is not a measure of the increase of any particular individual’s productivity, but of the increase of the productivity of a collective entity: the country, or nation. Because the Center is advocating the maximization of GDP growth as a desired goal, it is implicitly advocating for the interests of a collective (the country, the nation), whether or not such a goal is in the interest of a particular individual. In other words, the Center is necessarily advocating in favour of what utilitarians and other collectivists are prone to calling “the greater good” (“greater”, as in: “of greater importance than the good of any one individual”). One cannot seriously expect to found the advocacy of individual freedom upon maximization of something that designed to serve “the greater good”; the good of the collective. When one uses the economic benefit of the greater good as the basis for arguing that individual freedom is desirable, one instantly undermines the cause of individual freedom. Every instance of individual freedom that leads to an economic result in which the collective does less well than it otherwise would have done but for the individual freedom serves as an argument against individual freedom. Does the use of marijuana, or alcohol, or opiates decrease growth in the collective productivity of the country? If so, then the result of alleged individual freedom advocates holding up collective productivity growth as a desired goal implies that some of the revenue spent by government should be used to force individuals not to use such substances. The violation of liberty is thereby held up as somehow being consistent with, or even necessary for, the defence of individual freedom. Second, the assertion that there is an ideal size of government, together with the assumption that the size of government is properly measured by spending as a percentage of GDP, implies that it is ideal for the government to grow – more precisely, that it is ideal for government spending to grow — as GDP grows. The Center for Freedom and Prosperity having as one of its aims greater productivity, the Center is, ironically, advocating the continuous growth of government (assuming the economy continues to grow). So, if one starts with the libertarian notion that “the best government is the government that governs least” (i.e., that smaller government is necessarily more compatible with individual freedom than is bigger government), one is left with the self-defeating spectacle of libertarians implicitly arguing for ever-growing government; a growth allegedly serving “the greater good”. Worse, the Center provides us with not even an attempt to explain why productivity growth leads to a situation in which government needs more money. If one individual’s efforts increase the productivity of the country, it does not follow that that productivity increase causes a state of affairs in which defending life, liberty, and property becomes more expensive. The notion that government spending should increase as a percentage of GDP is a welfare statist conception, founded upon the notion that so long as the percentage of wealth stolen from the public does not change, there is no harm done: the amount of wealth transferred from the increasingly productive to the under-productive or non-productive can increase as the economy grows. Such wealth redistribution, being accomplished by a gun pointed by government at the head of every producer, is neither an incentive for production nor consistent with the role of government in a free society: defending every individual’s life, liberty, and property. As another example, the government can spend $1.8M Canadian tax dollars to pay a year’s salary to approximately 6 Canadian judges who will try and convict murderers, rapists, and thieves. Alternatively, the government can spend that $1.8M Canadian tax dollars to buy a painting comprised of three vertical stripes (“Voice of Fire“). The arrest and conviction of criminals will facilitate productivity and trade, but the purchase — by a non-productive entity such as government – of three lines on a canvas, will not increase productivity. To the contrary, the government’s purchase of the painting may well reduce productivity by taking money out of the hands of producers (i.e., taxpayers) who would have used the money as capital with which to facilitate more valuable production. Fourth, in a political context, individual freedom means: not having ones life, liberty, or property taken without ones consent. Individual freedom is not a reference to government using force (i.e., laws, backed by guns) in an attempt to maximize the increase of the collective productivity of the country’s inhabitants. Individual freedom is not a reference to government using force to increase tax revenues and government spending when the country’s productivity increases. Individual freedom does not refer to government using force to redistribute wealth from those who produce it to those who do not. All such uses of force in the economy are instances of the very coercion from which the government is supposed to be protecting individuals. They are instances of the very crimes for which the government rightly arrests and imprisons people. They are evidence that the government now regards itself as being above the law. The whole notion of “smaller government”, similarly, has nothing per se to do with individual freedom. Individual freedom depends upon the quality of government, not the quantity of it. Individual freedom is not a function of how big or small a government is, per se, but of how effective government is in defending every individual’s life, liberty or property; how effective it is in ensuring that no person is deprived of his life, liberty or property without his consent. A small government that does not defend life, liberty and property is less desirable than a big government that limits itself to doing so. Therefore it makes no sense to assert that there is a given percentage of GDP that the government should take and spend (i.e., it makes no sense to advocate that there is a right size for government based upon economic figures). A government’s expenditures will properly depend upon such things as how much crime there is; how many thieves, rapists, and murderers there are, et cetera. A largely moral and peaceful society with a given GDP will be much less expensive to govern than a largely immoral and violent one with the same GDP. The libertarian’s conscious or unconscious attraction to economics is founded upon the hope that if you give people common quantitative conclusions with which they can agree, they will voluntarily stick their heads in the sand, or keep their mouths shut, with respect to the qualitative commitments that make their fellow libertarians their political enemies. And so we have libertarians who rally behind the anti-abortion Ron Paul, a proponent of Austrian economics, joining with libertarians who rallied behind – and continue to praise – pro-choice libertarians like Murray Rothbard who, similarly, was a proponent of Austrian economics. In discussing libertarians, I do not imply that I restrict my criticism – concerning the use of economics to justify individual freedom, or to bring people together despite their substantive opposition – to libertarians or members of Libertarian parties. The same misguided attraction to economics imperils other political parties. For example, in a recent interview of blogger Andrew Lawton by Libertas Post, Lawton took the libertarian position that health care should be entirely privatized. Lawton is anti-abortion and he considers himself a “social conservative”. Yet he told Libertas Post that “at the end of the day, I think the most important issues that we have to work on as conservatives are the issues that we agree on, which are economic issues”. Like the big L libertarians, the big C conservatives attempt to use economics as a no-conflict zone between warring factions who somehow think it desirable, for electoral ends, to work together though their desired governmental ends are mutually exclusive. In contrast, when libertarians – holding themselves out to be proponents of individual freedom — use economic arguments to bring together individuals who oppose one another on qualitative matters (e.g., anti-abortion vs. pro-choice), each instance of disagreement on such fundamental qualitative matters — among alleged advocates of individual freedom — serves to convince the public that “individual freedom” itself is itself an ambiguous concept; individual freedom itself is undermined. The prospects for individual freedom would be undermined even more were libertarians — having been drawn together by economic arguments — somehow to win the reigns of governmental power. Returning to the abortion example, when conservatives disagree about abortion, and decide upon a “compromise” law in which women are free to have abortions in the first five months of pregnancy, but in which abortions conducted thereafter are punishable by imprisonment, the wisdom or insanity of the law is attributed to conservativism or to a Conservative party. In contrast, were a governing libertarian party — a governing party that claims to be comprised of proponents of individual freedom — to adopt the same 5-month law for abortions in order to accomplish the same comprise between its anti-abortionist and pro-choice membership, what would that tell the onlooking public? It would tell the public a range of falsehoods: that “individual freedom is not absolute”; that compromise is, per se, a virtue, and is necessary; that “individual freedom is good in theory, but it doesn’t work in practice”; that, ultimately, any argument in favour of individual freedom is flawed; that advocates of individual freedom are “naive” and should be ignored. In short, even were it possible to use economic arguments to unite de facto political opponents to win an election, the winning of the electoral battle would only serve to undermine the cause of individual freedom. Accordingly, in a free society, economic arguments are of no use to government except for the identifying instances where an individual’s life, liberty or property is being taken without his consent (e.g., arguments about the nature and effect of fractional reserve banking, monetary inflation, the use of gold as money, et cetera). Any economic argument in favour of government having an economic aim other than a free market serves not to defend individual freedom, but to undermine it. Oh Paul, you’ve mislabeled your graph. It reads “libertarian ideal” where you know that libertarians disagree about the Rahn Curve. Consequentialist libertarians will tout it, but Objectivist libertarians, for example, will dispute its usefulness. So will natural rights libertarians. I agree that libertarians disagree, and about a great number of things (that’s almost what makes them libertarian). And I agree that it is the Consequentialists who will find no problem embracing the curve (it’s the Humeans and the Kantians in the Economics field that seems to be the most influential core of the consequentialists). I don’t think we can conclude that being a natural rights libertarian makes one opposed to the Rahn Curve, however. Many, many natural rights libertarians are anarchists, and there is nothing about the units of which the Rahn Curve is comprised (GDP growth, and %age of GDP taxed and spent by government) that could not – were the data to change over time – be compatible with a finding that GDP growth is maximized when government does not tax and spend at all (i.e., with a finding that anarchism leads to the greatest amount of GDP growth). In short: anarchists who consider themselves “natural rights libertarians” could easily adopt a curve generated in the exact same way were the measurements to change. Moreover, the “minarchists” who are “natural rights libertarians” unfortunately are no less victimized by the folly of using economic arguments to advocate libertarianism. In other words: the fact that one believes each individual to have rights of some sort does not necessary imply the understanding that using non-essential arguments, like the Rahn Curve argument for smaller government, is ultimately counter-productive, given their goal. Objectivists – having as their essence the idea that all decisions and concepts should be in accord with the facts of reality – oppose libertarianism’s inherent subjectivism, which subjectivism entails the embrace of mysticism, irrationality, and self-sacrifice, each of which leave libertarian politics utterly equivocal, ambiguous, and disconnected with the facts of reality. Hence libertarianism’s often-snarked hatred of Objectivism and Objectivists (except those pretend-Objectivists who embrace libertarianism: Kelley and the lot), and Objectivism’s condemnation of libertarianism. But we’ve had that debate before. The more interesting debate for us to have is the one I had to put on hold when I started “The Principle of Pot” in November of 2008. I’ll pick up that essay again, and send it to you for a counter-point in due course. As a reminder: it’s about libertarianism and Objectivism, but as it relates to the broader topic of the role of philosophy in governance. I find this argument against the Rahn Curve unpersuasive, at best. He seems to imply that the Rahn Curve DEMANDS a certain level of government spending, when that is not the case at all. All the Rahn Curve implies is that the ideal RANGE of government spending APPEARS to fall in the 15% to 25% range, based on studies of worldwide examples over the long term. Most of his arguments for government spending fall into this range. Personally, I think the Rahn Curve has a lot of merit, simply because numerous studies have shown that private enterprise is far more EFFICIENT at accomplishing tasks (the profit motive minimizes costs – something lacking from government spending). Greater efficiency at accomplishing tasks leads to greater overall productivity, which in turn leads to greater overall prosperity. A small increase in productivity (say 3% vs 2%), when compounded over 2 generations (40 years) will lead to about a 50% increase in average income. My own view is that liberty is the engine of prosperity. So measuring our prosperity is not a measure of collective performance but rather it is a measure of liberty. 4. Therefore, the more government costs that are imposed upon society the lower will be the demand and the slower will be economic growth. Thus it seems to me that slower economic growth is an indirect measure of government interference. When government actions, which ALWAYS tend to depress economic activity, are beneficial (say building a road) then the net result can be positive for the economy. Other activities (say a wealth transfer) are harmful to liberty AND harmful to the economy. So it seems to me that this blag has some interesting ideas AND views but they do not convince me that economic growth, the size of government, and liberty are totally separate. You are turning Rahn curve into something it was not. Most libertarians and classical liberals do not support “Macro Economics of Aggregates” as it assumes a State Central Planning monopoly power exists. What Rahn did – was use global economic aggregate data from the world economies and measure the aggregates used by Keynesian masses to gather empirical trending data on GDP/GNP growth rates vs the comparable proportional structures. What you will find is a trend where maximum financial measured growth and expansion in “REAL” vs Nominal Terms in per capital – comes from smaller Governments. Each Country was different as you put forth – but the general TREND showed greater benefits of “capital goods” and financial distribution of wealth based on smaller government. In fact the problem with finding whether even lower ratios provided better growth rates did not exist because such countries did not exist with a modern economy.